A Chartered Engineer and Member of the Institute of Mechanical Engineers, Peter has worked on projects from vibration mitigation through to being a Logistician and Project Coordinator for a 100 bed hospital in Sierra Leone. 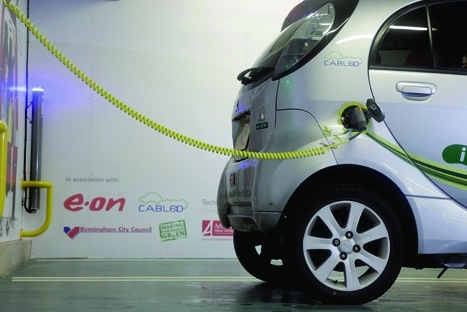 Peter is currently involved in the Coventry and Birmingham Low Emissions Demonstrator (CABLED) programme, the largest public trial of low carbon vehicles in the UK. A popular New Year pastime is forecasting the year ahead and checking previous predictions against actual outcomes, so for this blog I thought I’d follow this tradition. Over the past three years many companies and organisations have tried to predict the rate of electric vehicle (EV) uptake but only in the last year have sufficient vehicles become available for early take up rates to be assessed. So how accurate have these forecasts been and what do the true figures tell us about our motoring future? Worldwide, no more than 50,000 plug-in electric cars were sold last year – about 1,000 of these are driving around the UK. That’s not a lot of cars, about 0.06 % of annual new sales in fact. As recently as March 2011 Frost and Sullivan predicted 72,000 sales worldwide and back in March 2010 the Committee on Climate Change predicted a total of 11,000 in the UK by now. An annual production forecast of 150,000 in April 2011 by PwC was probably a factor of three too optimistic. Of course these are very early days and uptake is currently limited by supply rather than consumer demand. Only a few OEMs currently have vehicles available for purchase and some of these have had to overcome early distribution and production problems. Several other manufacturers will bring models to the market in 2012. Forecasting the very early stages of deployment was always going to be difficult. So what if we look a bit further ahead? Say, 2020? Well, the ‘average’ prediction is for about 8% of sales worldwide. But the spread is considerable, with many predictions below 3% and some in excess of 20%. If you plot the predictions for 2020 against the date the prediction was made, you can argue that the trend of the last 3 years is a reducing expectation of market penetration. Interestingly, if you sum each country’s national target you get to about 8%. If you sum all manufactures production targets, you get less than 2%. One thing is clear, that there is still little consensus. The most recent forecasts still range from 1% to 15%. Part of the problem is chickens and eggs, or cars and charging posts. Who will buy a £25,000 car when there is nowhere to charge it? Who will pay the same amount for a few charging posts when there is no-one to use them? The UK government is seeking to accelerate the infrastructure deployment by subsidising publicly accessible posts in its selected ‘Plugged-in-Places’ locations. But it is also relying on employers to install charging posts at workplaces. It is not clear why an employer would choose to do this as there is no practical means of recovering the installation costs – and no employee expectation of charging post provision. What is even less clear is how you might try and predict the outcome of this dynamic 8 years hence. The other significant influencing factor will be cost – vehicle sticker price and total cost of ownership. Purchase price is expected to reduce slowly with battery costs predicted to fall from about $1000 per kWh to between $290 and $650 in 2020. But relative ownership cost (compared to petrol / diesel vehicles) is a very strong function of oil price, the price of carbon and tax policy. Who would like to predict any of those, let alone all of them, more than a year or so ahead? What we do know, is that in Europe, fuel taxes are higher, environmental legislation is stronger, and driving distances are shorter (compared to the US at least). These factors, combined with strong government support, are likely to lead to a faster rate of take up in Europe than elsewhere. Predictions for the UK and France, which both provide EV purchase subsidies, average out at about 14% of sales in 2020, nearly double the worldwide penetration. As ever, the great unknown is China. It overtook the US market for passenger cars in 2009 and an EV favourable policy decision in China could lead to huge local demand, most likely served by local OEMs. So it is little wonder that forecasts vary so greatly. Vehicle supply will increase significantly in 2012 and by the end of the year we might know more about consumer reaction to this new technology. The only thing I would confidently predict is an enduring lack of confidence in take up forecasts. A few OEMs have made billion dollar bets on EVs; they will have to wait a few more years before they find out if they have backed a winner. Although I can see the sense that electric cars will reduce pollution during the day time hours I have to ask the question, ‘what happens during the power stations normal quiet time during the night when everyone is charging their cars ready for work the next morning? Surely these power stations will be churning out pollutants when they would normally be working on much reduced levels. Perhaps the new nuclear power stations will be used in lieu of the coal or gas fired stations or maybe we will all have to say our evening prayers asking the almighty for plenty of wind in our sleeping hours (no pun intended). With fossil fuels quickly running out , increase in production of EVs is inevitable. Yes the power stations will see an increase in demand during the night but the fact people don’t have to fill up with petrol counteracts this. As production of EVs increases so too will the demand for renewable electricity and we will whiteness a large growth in the engineering sector. Until more is done to reduce congestion, then the EV is on a hiding to nothing, as the EV will do nothing to counter this problem. Traffic jams of EVs will be quieter but no shorter, as the driver might consider the energy used to power the radio/MP3 player may reduce his/her ability to reach the comfort of home. There are other solutions such as Personal Rapid Transit (PRT) that would be effective at reducing congestion as well as being energy efficient, which need to be given more of an airing and more Government support, perhaps on a par with EVs. Fossil fuels are surprisingly abundant, there is a technology available to burn refined coal in cars and car engines are getting more efficient. Electric cars exist because silly governments think they can pick winners. They never learn! We recently had a demo of an electric car here in Orkney (pop 20,000) and it was very informative. The islands already produce more electricity than we need from wind and there are big plans for wave and tidal schemes too, so we have the carbon free, sustainable power available now. The modelling seems to show that electrification would add a few % to the UK’s electricity demand (probably around 10%) and the charging for that could be done off peak. The vehicle charged overnight easily from a domestic socket, and actually only took a few hours in the night (so the charging of the fleet could all be staggered smartly too). The wind here doesn’t seem to know if it is day or night, so we could easily charge a fleet from existing home sockets (as we proved recently). Getting a few charging points into public areas is useful and work pretty essential, but you can get an interest free loan for this and it would be tax deductable too. The range on the car made the users a bit nervous at first, but after use we found that the journeys we planned were well within the capability of the car, and charging needed planning if it was not to be an obstruction. The capital costs are too high at the moment by about £5k (and that is after taking off a grant of £5k), but this is a technology that has its uses now in some niches….. and that means more than just as a city runabout….. as we recently proved to ourselves. The electric vehicle is a loser on three counts: Initial cost, range, and time to refuel. Without overcoming these issues take up by the general public will always be very low. Companies who have invested heavily in this technology are hoping that the governments of their prospective markets will comtinue to subsidise the cost of purchase and put up taxes on fossil fuels in order to stimulate demand. And what of resale value? Who will buy a second hand electric vehicle if there is a chance that the battery pack will need replacing anytime in the near future. Then consider the recycling challenge of all the batteries. Allied to the production processes are they really more environmentally friendly?